As political and economic unrest roils Venezuela, U.S. asylum applications filed by Venezuelans so far in fiscal 2016 have jumped 168% compared with the same time period a year earlier, according to a Pew Research Center analysis of U.S. Citizenship and Immigration Services data. To be eligible for asylum in the U.S., people must have fled their home countries due to fear of persecution due to race, religion, nationality or politics. Once in the U.S., those who apply for asylum may legally stay in the country while their application is evaluated, a process that can take years. For example, in the asylum office in Arlington, Virginia, those who filed their applications in January 2014 had interviews scheduled in May and June 2016. The wait is longer in the Los Angeles office, where some with interviews scheduled in May and June had filed as far back as August 2011. 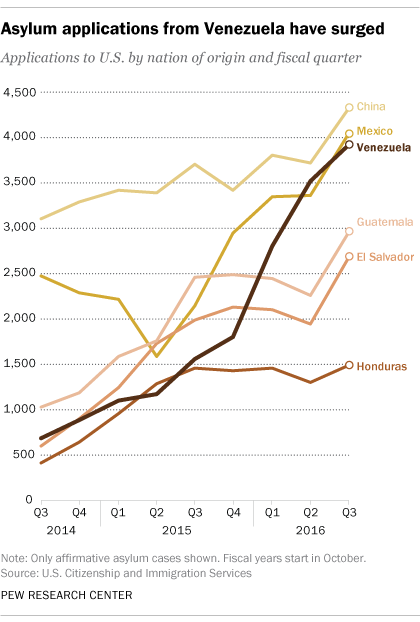 So far in fiscal 2016, Venezuela trails only China (11,826) and Mexico (10,749) in asylum applications to the U.S. Venezuela’s monthly asylum applications reached 1,370 in June 2016, a sharp change from two years ago: In February 2014, only 92 Venezuelans applied for asylum. The U.S. has also seen a sharp rise in asylum applications from Mexico, rising from 2,133 in the third quarter of fiscal 2015 to 4,054 in the third quarter in fiscal 2016. Applications have been rising over the past decade, in part due to drug-related violence there. Venezuelans seeking U.S. asylum represent a small share of the United States’ overall Venezuelan immigrant population. There are about 225,000 Venezuelan-born immigrants living in the U.S., and some have been in the country for years – 59% have lived in the U.S. for more than a decade. About half live in Florida, with many living in the Miami suburb of Doral. Venezuelan immigrants in the U.S. have higher levels of education than Hispanic immigrants overall – 53% of Venezuelan immigrants ages 25 and older have a bachelor’s degree or more, compared with 29% of Hispanic immigrants. At the same time, in 2014, 43% of Venezuelan immigrants were naturalized U.S. citizens, and between 25% and 30% were estimated to be in the country without authorization. In fiscal 2015, Venezuela was among the top 10 countries whose citizens had overstayed their visas in the United States, according to a partial estimate of visa overstays by the Department of Homeland Security. While the U.S. is the top destination country for Venezuelan immigrants, Spain is home to about 150,000 Venezuelan immigrants, the second-most common destination country. From January to May 2016, 1,040 Venezuelans applied for asylum to the European Union, with nearly all applying in Spain. This exceeds the total from all of 2015, when 790 Venezuelans applied for asylum to the EU, according to Eurostat, the EU’s statistical agency. In addition, some Venezuelans are migrating back and forth across the borders of neighboring countries. For example, more than 35,000 Venezuelans recently crossed into neighboring Colombia in search of basic household goods like flour, soap and toilet paper.